November’s a good month for celestial shadow play. Stargazers will get two eclipses in about as many weeks, the first a dazzling total solar eclipse that will showcase the sun's corona approaching peak activity, and the second a subtler lunar eclipse that will be visible across much of the United States. The theatrics start on Nov. 13, when residents of northeastern Australia get a false-start sunrise. Just an hour after the sun breaks the horizon in the coastal city of Cairns, it will be fully obscured by the moon, whose shadow will darken the sky and bring the stars back into view for 2 minutes there. 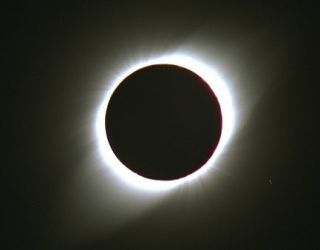 The only visible part of the sun during the total eclipse will be its glowing corona, or outer atmosphere, protruding around the moon’s silhouette. The peak of the sun’s regular 11-year activity cycle, usually marked by increased sunspots, solar flares and magnetic bombardments from the sun here on Earth, is expected to arrive in early or mid 2013. Berman is part of a three-man crew who will be capturing and broadcasting the solar eclipse live with a telescope in northern Australia, the only land area that will witness the total eclipse. (People in parts of New Zealand and Chile will see the sun partially obscured as the moon crosses the sky.) Viewers from around the world can watch the Nov. 13 webcast for free starting at 2:30 p.m. Eastern Standard Time (1930 GMT) on the Slooh Space Camera, an online service that allows users to observe the night sky from a global network of telescopes. Slooh will also broadcast the month’s second eclipse, a penumbral lunar eclipse that will take place on Nov. 28. A lunar eclipse occurs when the Earth, sun and moon align in the other possible configuration, with the Earth situated in the middle and casting a shadow on the moon. In a penumbral lunar eclipse, the moon never passes through the dark inner core of the Earth’s shadow, the umbra, but only the hazy border, the penumbra. November’s penumbral lunar eclipse will manifest as a slight but noticeable darkening of the northern half of the moon; the dimming should be easily visible to the naked eye after most of the moon has dipped into the Earth’s penumbra. The early-morning eclipse begins at 7: 14 a.m. EST (1214 GMT) and ends at 11:51 a.m. EST (1651 GMT), but the darkening will be most apparent between about 9 a.m. EST (1400 GMT) and 10 a.m. EST (1500 GMT). Observers in the Eastern United States will miss out on the lunar eclipse, as the moon will already have set there when the eclipse begins. But the rest of the country can watch at least part of it, with the duration of visibility longest for people on the West Coast and in Alaska. Skywatchers around the world can use this NASA graphic to check if they’ll be able to watch the lunar eclipse from their backyard. Editor's note: If you catch a great photo of one of the month's eclipses that you'd like to share for a possible story or image gallery, please contact managing editor Tariq Malik at tmalik@space.com.